Analytic pipelines running purely on batch processing systems can suffer from hours of data lag, resulting in accuracy issues with analysis and overall decision-making. 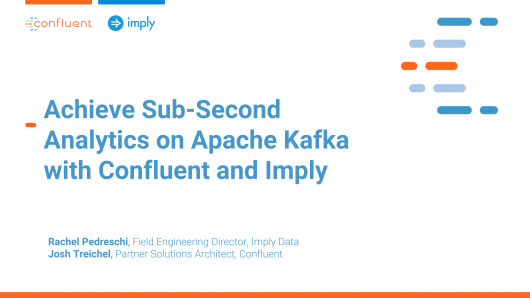 Join us for a demo to learn how easy it is to integrate your Apache Kafka streams in Apache Druid (incubating) to provide real-time insights into the data. Rachel Pedreschi is the Field Engineering Director at Imply Data. A "Big Data Geek-ette," Rachel is no stranger to the world of big data, fast data, and everything in between. She is a Vertica-, Informix-, and Redbrick-certified DBA on top of her work with Apache Cassandra, Apache Ignite, and Apache Druid. She has more than 20 years of high-performance database experience. Rachel has an MBA from San Francisco State University and a BA in Mathematics from University of California, Santa Cruz. Josh Treichel is a Partner Solutions Architect at Confluent. As a software engineer he’s spent over 10 years building, integrating and supporting complex systems. He previously worked on Confluent’s Customer Operations team supporting some of the largest Kafka/Confluent deployments in the world.